Tomorrow >>> My sweet baby boy turns 3. I'll deal with that ball of emotions later, but for today, I've got to get moving and shaking. He wants a pirate cake and has not let the pirate knife he got at the beach out of his grip for one second since we got back home. He requests demands that I say "Aye, aye, Captain!" in response to anything he tells me and then tries to get me with his knife. Arrrrrrrh! Thursday >>> Our 10 year anniversary. I don't think we'll be doing too much due to lack of childcare, but I'm trying to think of little ways to make it special for him. Ideas? Friday >>> The last day of school for Riley (1st grade). As for homeschooling Tyler Bree, we've kinda weened off the new stuff since last week, but I plan to continue the reading and math throughout the summer...and that goes for Riley as well. School party on Friday and the girls' annual end of school haircut (I still love watching this video from the first year I surprised them with it)! 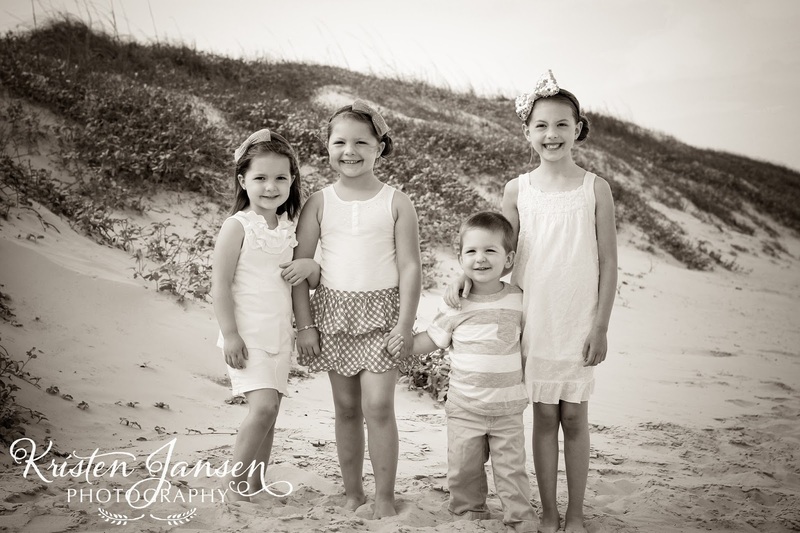 Here's my favorite of the kids from the beach...everyone is semi looking and smiling...we'll call that a success. There will be an amazing giveaway coming up later this week, so don't miss it! I promise...it's GOOOOOOD!